Working women in Southern Italy eager to get back to what they do best, cooked this sauce called ‘sugo alla puttanesca” over in an oil drum on street corners. That is the legend of the “whore’s sauce” called Puttanesca. It does make the sauce, saucier. Not that it’s needed it’s saucy enough. 1. Heat 3 TB of EVOO to medium-high in a large deep saute pan, add the Garlic, Onion & Anchovies. Cook, stirring occasionally, until the Garlic is lightly golden, the Onion is translucent, & the Anchovies have melted. 2. Drain the Tomatoes & crush them with your hands as you add them to the pan, add the Salt & Pepper. Cook, stirring occasionally, until the Tomatoes break down & becomes sauce like, about 10 minutes. 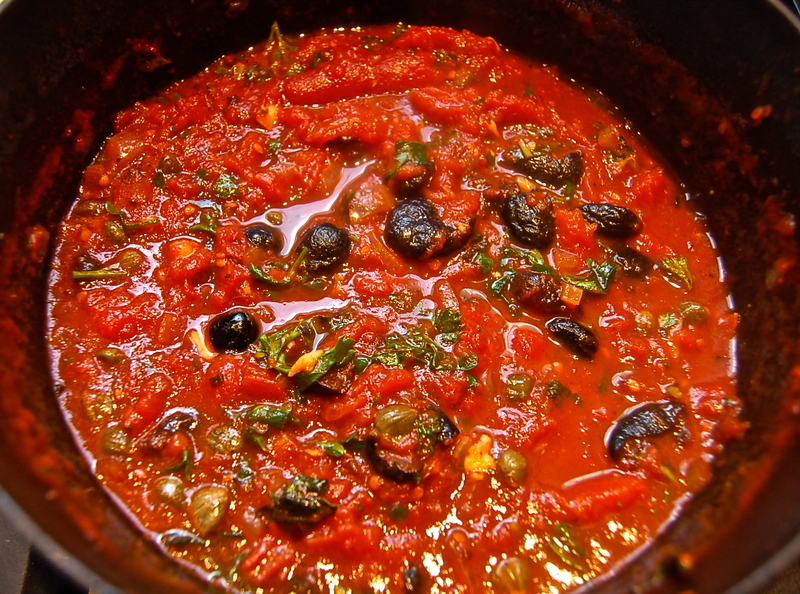 Stir in the Olives, Capers & Red Pepper Flakes, & continue to simmeruntil the sauce slightly thickens. 3. Taste and adjust the seasonings to your taste. I prefer a spicy Puttanesca. Add the chopped Parsley & Basil to the pan & gently mix.